When you get a chance to close out an opponent, you need to do everything you can to make that happen. 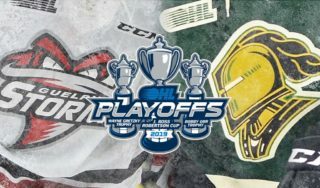 The London Knights put that sentiment to the test in a 5-2 victory in Windsor on Thursday night to close out their first-round series with the Spitfires in four straight games. Another old adage says that your leaders have to lead to bring success in the post-season. 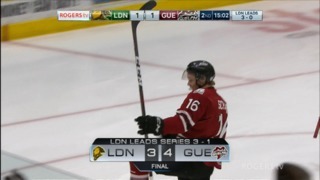 In their series-clinching game, every London player who scored a goal or picked up a point was a veteran. Alex Formenton had four assists to push him into the playoff scoring lead past teammate Evan Bouchard and Nate Schnarr of the Guelph Storm. 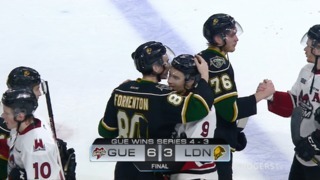 Formenton had two goals and 11 assists in four games against Windsor. Billy Moskal had a goal and an assist in Game 4 against the Spitfires, and Adam Boqvist scored two more goals. The Chicago Blackhawks prospect may want to find a way to play another game in Windsor: he scored six goals in the two games played at the WFCU Centre. Completing the sweep will give the Knights a chance to get set for what comes next. 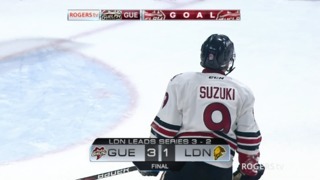 London is a Sault Ste. Marie victory away from matching up with the Guelph Storm in Round 2. London assistant coach Rick Steadman says the way the series went against the Spitfires definitely works into the Knights’ favour. The Knights had the best penalty kill in the OHL during the regular season. The special teams’ attention shifted to their power play in the first round. London had a 53.8 percent success rate with the man advantage. Steadman believes the credit belongs to the way the players executed. “They are going right now. [Bouchard] is doing a good job distributing to both sides to [Boqvist] and [Formenton], who are going to be really good NHLers coming down. It’s hard to stop,” he said. London’s power play scored seven goals in 13 chances. Their penalty kill against the Spitfires wasn’t too shabby, either: the Knights killed off Windsor chances 93.3 percent of the time. Jordan Kooy earned his fourth win of the playoffs. He made 23 saves. Kari Piiroinen made 24 in net for Windsor. Boqvist kicked off the scoring with his fifth goal in three periods and 97 seconds. With London on a power play, Boqvist took a pass on the right side of the Windsor end and wristed a shot in to make it 1-0 for the Knights. Windsor tied the game at 13:54 when Tyler Angle banged in a rebound in front, but the Knights grabbed the lead back just under four minutes later as Will Lochead cut across the Spitfires’ end from right to left and buried a snap shot to give London a 2-1 advantage through 20 minutes. Kevin Hancock put the Knights up 3-1 as he knocked a puck out of the air that Piiroinen tried to clear out of his own end after he had left his crease to get it. Hancock shot the puck into the empty net for his first goal of the post-season. The Spitfires closed the gap to 3-2 on a wrist shot by Connor Corcoran and then, before the end of the period, Boqvist struck again for his sixth goal in five periods, sending the Knights to the third period ahead 4-2. The Knights blanked Windsor in the third period and limited them to four shots. Billy Moskal scored into an empty net with 1:14 to go to close the scoring. The Knights will wait and see who they face next.